While I was in 4th grade in Elementary School, I was placed in 5th grade English class. Unfortunately, this also meant I had GYM class with the 5th graders. I was on the “chubby” side, a “couch potato” before the term was invented. I liked Oreos much better than I did playing sports. And I was not good at sports, particulary if there was a ball involved, but that’s a story for another day. 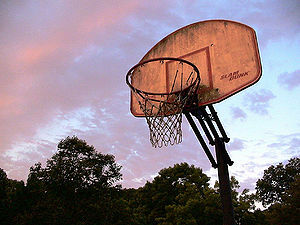 One ghastly day, we were going to play basketball. Five fifth-graders were picked at random to be on one team. Five of us were picked to play against them. The other four players on my team scrambled to pick who they would play against. I was assigned to “guard” the team giant, John. He was probably only 6 feet tall at the time, but he might as well have been 8 feet tall. There was no way I was going to be able to stop him from making a basket, on any level. Not height, not speed, not strategy. The gym teacher, Mr. B, a nasty old man who had no business being within 100 yards of children, yelled at me the whole time. I was humiliated. Later that day, I went home and ate Oreo cookies to numb the pain with a good sugar rush. Another day, we were getting ready to play basketball, and a poor unfortunate soul named Mark bounced the ball while Mr. B was talking. Mr B was highly insulted, and gave each of us a basketball to bounce while he forced Mark to recite his name and address LOUD enough to be heard over the bouncing balls. I also remember Mr. B yelling at a little skinny girl named Kathy, because she had the courage to say “who cares!” during one of his lectures on softball rules. After elementary school, I thought I was free of Mr. B, but he later became one of the High School gym teachers. By then, I had figured out a strategy of how to skip gym class.